EcoShield natural fiber insulation is comprised of recycled denim with a microbial mold and fungal inhibitor. It is thermally and acoustically comparable to fiberglass. Liners come in a variety of stock and custom sizes. 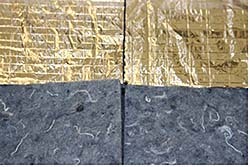 Offers high air erosion tolerance and meets the same ASTM C1071 standards as fiberglass.